"Politics was also violent. There was hand-to-hand combat and rioting at polling places. On one memorable occasion in Washington in 1857, three nativist gangs -- the Plug Uglies, the Chunkers, and the Rip-Raps -- joined forces to terrorize immigrants casting votes, causing a riot. When the panicked mayor called in the Marines, the three gangs hauled a cannon into play, though they never fired it. By the time the brawl subsided, several people had been killed. State legislatures also erupted into uproars from time to time. In 1857, there was an all­ out row in the Illinois legislature featuring 'considerable wrestling, knocking over chairs, desks, inkstands, men, and things generally.' In 1858, state assemblies in both New York and Massachusetts dissolved into fisticuffs. '[T]here was a most heavenly time in the House for an hour or two,' gushed a New York Times reporter about the Boston out­break. It 'would have made a sensation even in Congress.' The Arkan­sas House deserves special mention. In 1837, when a representative insulted the Speaker during debate, the Speaker stepped down from his platform, bowie knife in hand, and killed him. Expelled and tried for murder, he was acquitted for excusable homicide and reelected, only to pull his knife on another legislator during debate, though this time the sound of colleagues cocking pistols stopped him cold. "Congressional violence was of a piece with this world. As I researched this book, I discovered that between 1830 and 1860, there were more than seventy violent incidents between congressmen in the House and Senate chambers or on nearby streets and dueling grounds, most of them long forgotten. This isn't to say that all such fighting has vanished from view. Many studies of the coming of the Civil War note a surge of fighting in Congress in the 1850s. Most such books -- and many more besides­ -- offer a vivid account of the most famous violent incident: the caning of the abolitionist senator Charles Sumner (R-MA) in 1856. 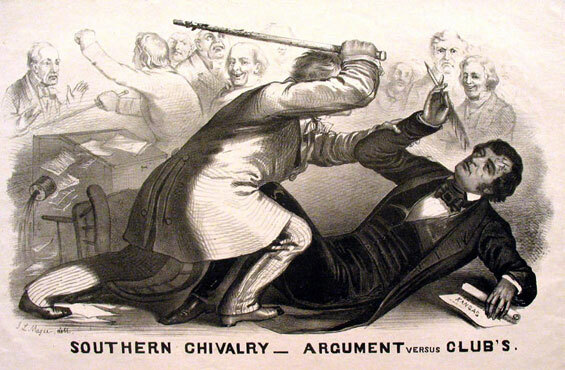 A political cartoon depicting U.S. Democratic congressman Preston Brooks' attack on Republican congressman Charles Sumner, an example of legislative violence. "My archival digging revealed much more. I found canings, duel negotiations, and duels; shoving and fistfights; brandished pistols and bowie knives; wild me­lees in the House; and street fights with fists and the occasional brick. Not included in that number is bullying that never went beyond words. Therein lies a problem, because the threat of violence had an enormous impact on congressional debate, but proving that someone has been bul­lied into silence is no easy matter. Some such episodes appear through­out the book, but only when substantiated by concrete evidence. There was far more bullying than appears on these pages. There was also more violence. The words that people used to describe these fights and showdowns -- thrashing, bullying, pistoleering, stampeding -- offer a re­vealing ground-level glimpse of the antebellum Congress. They expose the tobacco-stained rugs. "Detecting those rugs can be difficult; politics is often Janus-faced, presenting a composed public face to the world while masking a less savory private one. This was especially true in the first half of the nine­teenth century. Washington newspapers had a tangled relationship with Congress; many of them survived on government printing contracts, and Congress did the granting, so local newsmen were well advised to make Congress look good by not recording the gritty details of congres­sional threats and violence. Describing congressional rumbles was also dangerous for reporters; record an insult the wrong way -- or the right way -- and you might become entangled in an honor dispute and get pounded by a congressman. As a result, when it came to fighting, the Washington press offered bare-bones details when it mentioned it at all, showing plenty of bravado but few fists and weapons. For a time, these partially censored newspaper accounts were the nation's main news source for congressional proceedings, and the basis of the Con­gressional Globe, the period's equivalent of the Congressional Record. Not until the rise of a commercially independent national press brought out-of-town reporters to Washington in large numbers was congressional violence reported in some detail, gaining its maximum impact through new technologies such as the telegraph in the 1850s-just as the nation's slavery crisis began to peak."